Are your data and operations safe should disaster strike? Business continuity encompasses both a plan and preparations than enable an organization to operate during a serious incident or recover quickly after a disaster. For any organization, business continuity is—or should be—a top priority. Depending on your business, a serious interruption in operations can mean anything from lost revenue to the loss of the business. Where do you start? 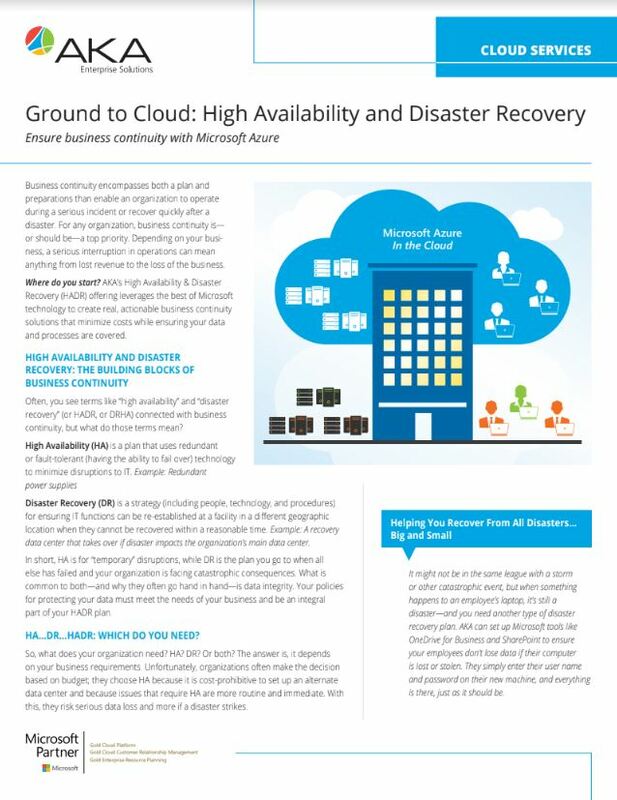 AKA’s High Availability & Disaster Recovery (HADR) offering leverages the best of Microsoft technology to create real, actionable business continuity solutions that minimize costs while ensuring your data and processes are covered. Often, you see terms like “high availability” and “disaster recovery” (or HADR, or DRHA) connected with business continuity, but what do those terms mean? Disaster Recovery (DR) is a strategy (including people, technology, and procedures) for ensuring IT functions can be re-established at a facility in a different geographic location when they cannot be recovered within a reasonable time. Example: A recovery data center that takes over if disaster impacts the organization’s main data center. In short, HA is for “temporary” disruptions, while DR is the plan you go to when all else has failed and your organization is facing catastrophic consequences. What is common to both—and why they often go hand in hand—is data integrity. Your policies for protecting your data must meet the needs of your business and be an integralpart of your HADR plan. HA…DR…HADR: Which do you need? So, what does your organization need? HA? DR? Or both? The answer is, it depends on your business requirements. Unfortunately, organizations often make the decision based on budget; they choose HA because it is cost-prohibitive to set up an alternate data center and because issues that require HA are more routine and immediate. With this, they risk serious data loss and more if a disaster strikes. AKA can help you make an informed decision, build a plan, and deploy that plan. Our High Availability and Disaster Recovery (HADR) offering leverages the best of Microsoft technology for creating solid, actionable solutions that won’t break the bank. We will work with you to design the right solution that minimizes costs while ensuring your data is always there and that you are meeting your Service-Level Agreements (SLAs) and RTOs/RPOs (Recovery Time Objective/Recovery Point Objective). With Azure, we can create a HA solution of any system or a full DR replica. We can also set up a plan for failing a traditional data center up to Azure, or Azure to Azure, or even Amazon AWS to Azure. The result: A real-time, always up to date back-up of any system or data center in Azure. This offering is available for systems that need real-time replicas or systems that are put into “cold storage” for compliance purposes. What about cost? You pay for the storage, and systems can remain “offline,” keeping the price of a secondary replica cost effective. In addition, even if your systems are all on premises currently, should you decide in the future to move them to Azure, you’re already well on your way. We’ll help you determine your license applicability for hybrid benefits in Azure so that when you decide to run in the Cloud, your costs are minimized. Fast, thorough, cost-effective implementations. 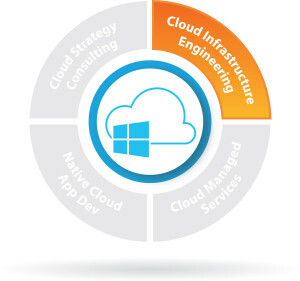 We have a proven implementation methodology and dependable tools for application lifecycle management, platform configuration, data migration, and environment migration, that will have you up and running in Azure in days, not months. Deep IT and business expertise. Rather than relying on an internal IT resource that might not have the knowledge you need, you have AKA’s business application and Azure consultants, developers, and support staﬀ as your IT team. We are certified in Azure and understand the importance of compliance with security and regulatory protocols like GDPR, HIPAA, and FedRAMP. Shared knowledge. In addition to designing and implementing your solution, we also bring value-added consulting and education to the table. We want to be your trusted partner, so we work closely with you, imparting our expertise while listening to your needs.